Published on March 16, 2015 by Rachelle J. Currently Reading: Buan: The Perfect Mortals by Reece Bridger, a review book, The Sparrow by Mary Doria Russell, Little Women by Louisa May Alcott for The Classics Club, The Fiery Cross by Diana Gabaldon, and The Essential Feminist Reader. Finished: Shadowmagic by John Lenahan, The Art of Asking by Amanda Palmer, and The Gift of Charms by Julia Suzuki, all of which I’ll be reviewing sometime this week, along with Nightfall Gardens by Allen Houston, which I was supposed to review last week. Take Control of Your TBR Pile Progress: I’ve read 3 books towards my goal of 4. Show Your Shelves Some Love Progress: 11 out of 51. Outdo Yourself Progress: 13 out of 66. Netgalley/Edelweiss Progress: 7 out of 50. 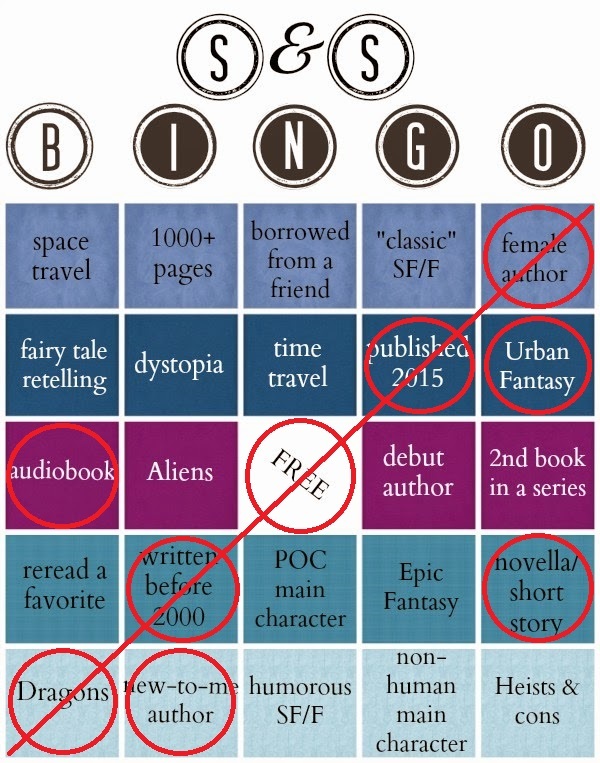 SF/F Bingo: I’m working on filling in the whole card, and it’s starting to get a bit more difficult. I had to do some rearranging in order to get the squares I have marked now, but I haven’t decided yet which square I’m going to put The Gift of Charms on. The obvious one would be “Dragons”, but then I would have to move The Sunken by S.C. Green. Total number of books for the year: 15. It’s Spring Break for me, and I hurt my back on Sunday, so I’ve got a lot of time on my hands for reading. I’m hoping I’ll be able to finish all of my current reads, or at least most of them, by the end of the week.